Yesterday I went back to friend Julie’s dyeing pots. I took with me some pieces from our last session that were OK-ish but not very interesting. More on them later as they are still steaming! A fortnight ago I wrapped some pale pink 80% cotton/ 20% silk fabric which had been dyed in avocado pips around some eucalyptus wandoo leaves. The little parcel has been sitting under brick and some plastic outside on the paving. I unwrapped it this morning. Yay!! I have finally succeeded in getting clear leaf marks! They’re not the richly coloured and filled in ones that the experts get but they’re the best I’ve achieved! 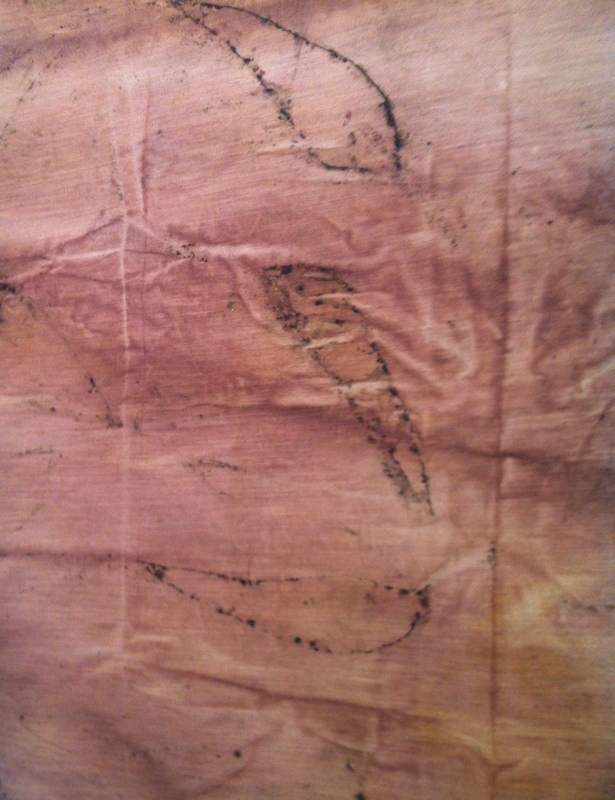 Fabric: 80% cotton ; 20% silk dyed in avocado pips , dried and washed, then pre-soaked in soda ash and wrapped around Euc. wandoo leaves, then left under pressure for two weeks. They are looking good, Margaret. Well worth the wait. It’s interesting that you get an outline rather than the filled in leaf – is it to do with the variety of leaf? I don’t know but I’m guessing it may have something to do with the fact that I didn’t bind the piece very tightly. 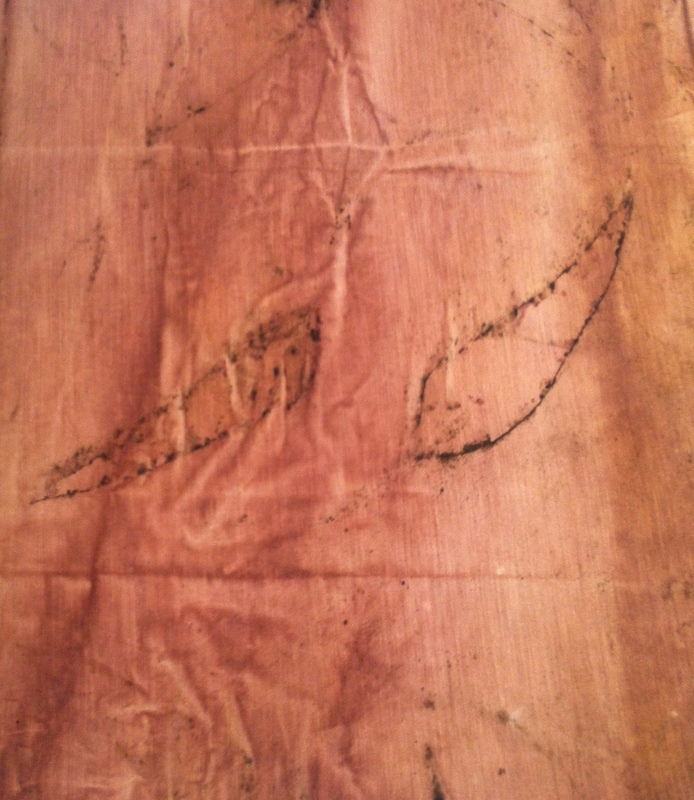 thus the hard edges of the leaves were more likely to come into contact with the fabric than the two faces. We’ll know soon as Ive just tightly bound an old T-shirt in the same leaves and it’s steaming as I write! Looks great Margaret. Looking forward to unwrapping our bundles from yesterday. Looks good Margaret – I find the outline alone quite intriquing!